1. India is poised for rapid economic growth. Such future growth will largely come from the secondary and tertiary sectors of the economy, i.e., the industrial and service sectors. Since economic activities in these sectors primarily take place in urban areas, the state of our towns and cities is crucial to India’s future growth. 2. Further, India’s urban population is currently around 30% of its total population. Experience across the world has been that as economies grow, rapid urbanization takes this proportion to over 60% before it begins to stabilize. As such, it is projected that India’s urban population would grow to about 473 million in 2021 and 820 million by 2051, as against only 285 million in 2001. Hence, cities must not only meet the mobility needs of the current population but also provide for the needs of those yet to join the urban population. In this context, the Government of India has launched the National Urban Renewal Mission (NURM) that inter-alia seeks to bring about comprehensive improvements in urban infrastructure, committing substantial funds for this purpose and requiring a series of reforms that would make the investments sustainable. Accessing jobs, education, recreation and similar activities is becoming increasingly time consuming. 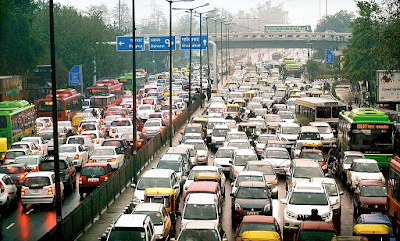 Billions of man hours are lost with people “stuck in traffic”. The primary reason for this has been the explosive growth in the number of motor vehicles, coupled with limitations on the amount of road space that can be provided. 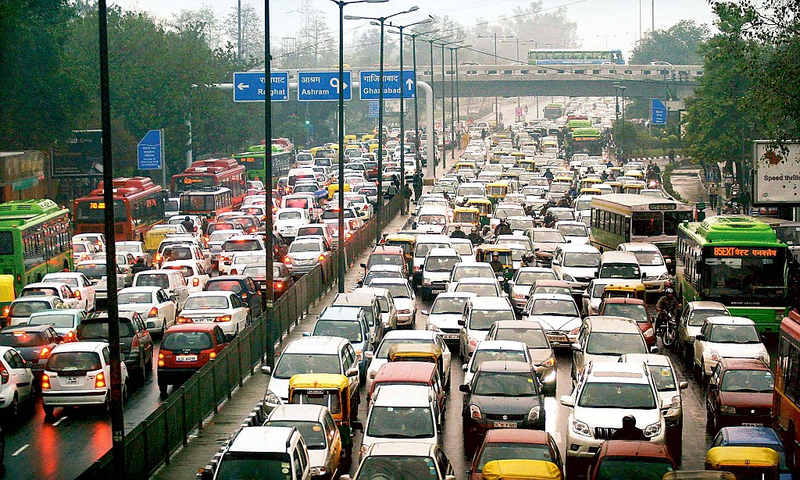 For example, on an average, while the population of India’s six major metropolises increased by about 1.9 times during 1981 to 2001, the number of motor vehicles went up by over 7.75 times during the same period. The cost of travel, especially for the poor, has increased considerably. This is largely because the use of cheaper non-motorised modes like cycling and walking has become extremely risky, since these modes have to share the same right of way with motorized modes. Further, with population growth, cities have tended to sprawl and increased travel distances have made non-motorized modes impossible to use. This has made access to livelihoods, particularly for the poor, far more difficult. Travel in the city has become more risky with accident rates having gone up from 1.6 lakh in 1981 to over 3.9 lakh in 2001. The number of persons killed in road accidents has also gone up from 28,400 to over 80,000 during the same period. This again has tended to impact the poor more severely as many of those killed or injured tend to be cyclists, pedestrians or pavement dwellers. Increased use of personal vehicles has led to increased air pollution. 4. Unless the above problems are remedied, poor mobility can become a major dampener to economic growth and cause the quality of life to deteriorate. A policy is, therefore, needed on the approach to dealing with this rapidly growing problem as also offer a clear direction and a framework for future action. To allow our cities to evolve into an urban form that is best suited for the unique geography of their locations and is best placed to support the main social and economic activities that take place in the city. Reducing pollution levels through changes in traveling practices, better enforcement, stricter norms, technological improvements, etc. A need exists to guide State level action plans within an overall framework. The launching of the NURM has provided a timely platform for providing significant financial support from the Central Government for investments in urban transport infrastructure. As such, this offers an opportunity for a meaningful national policy that would guide Central financial assistance towards improving urban mobility. A need exists to build capacity for urban transport planning as also develop it as a professional practice. A need exists to take up coordinated capacity building, research and information dissemination to raise the overall level of awareness and skills. 7. The objectives of this policy would be achieved through a multi-pronged approach that would revolve around the measures highlighted in the previous section. These are further elaborated in the sections that follow. 8. Cities in India vary considerably in terms of their population, area, urban form, topography, economic activities, income levels, growth constraints, etc. Accordingly, the design of the transport system will have to depend on these city specific features. Further, transport planning is intrinsically linked to land use planning and both need to be developed together in a manner that serves the entire population and yet minimizes travel needs. In short, an integrated master plan needs to internalize the features of sustainable transport systems. In developing such plans, attention should also be paid to channel the future growth of a city around a pre- planned transport network rather than develop a transport system after uncontrolled sprawl has taken place. Transport plans should, therefore, enable a city to take an urban form that best suits the geographical constraints of its location and also one that best supports the key social and economic activities of its residents. Unfortunately, however, transport planning has not received the extent of attention it should have in drawing up strategic development and land use plans. 9. The Government of India would, therefore, promote the development of such integrated land use and transport plans for all cities. To enable this, all urban development and planning bodies in the States would be required to have in house transport planners as well as representation from transport authorities in their managements. 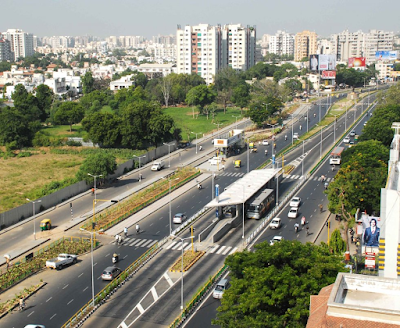 The Government of India would extend support for the preparation of such integrated land use and transport plans, to the extent of 50% of the cost involved in developing such plans, provided the city also demonstrates its willingness to act in accordance with them. In order to create models for possible learning and replication, the Government of India would fully support pilot studies in a few sample cities, of different characteristics and in different regions of the country. As part of this exercise, each city would also be encouraged to identify potential corridors for future development and then establish a transport system that would encourage growth around itself. For example, radial corridors emerging from the city and extending up to 20-30 kms could be reserved for future development. Such corridors would have to be protected from encroachment by putting up physical barriers along such reserved corridors and physically constructing roads on short stretches even before settlements come up. This would imply that stretches of the corridor would come up first in order to guide the location of the settlements and not allow undue sprawl to take place. 10. A scheme already exists under which the Central Government provides partial financial support for traffic and transport studies in cities. This would be modified to enhance the extent of Central Government support and also make these studies more broad based to integrate transport planning with land use planning, keeping projected populations in mind. 11. At present, road space gets allocated to whichever vehicle occupies it first. The focus is, therefore, the vehicle and not people. The result is that a bus carrying 40 people is allocated only two and a half times the road space that is allocated to a car carrying only one or two persons. In this process, the lower income groups have, effectively, ended up paying, in terms of higher travel time and higher travel costs, for the disproportionate space allocated to personal vehicles. Users of non- motorized modes have tended to be squeezed out of the roads on account of serious threats to their safety. If the focus of the principles of road space allocation were to be the people, then much more space would need to be allocated to public transport systems than is allocated at present. 12. The Central Government would, therefore, encourage measures that allocate road space on a more equitable basis, with people as its focus. This can be achieved by reserving lanes and corridors exclusively for public transport and non-motorized modes of travel. Similarly lanes could be reserved for vehicles that carry more than three persons (popularly known as High Occupancy Vehicle Lanes). Past experience has been that such reserved lanes are not respected by motorists and therefore lose meaning. In order to facilitate better enforcement of such lane discipline, suitable provisions would be introduced in the Motor Vehicles Act and other instrumentalities to enable stringent penalties for violation. 13. It is well known that public transport occupies less road space and causes less pollution per passenger-km than personal vehicles. As such, public transport is a more sustainable form of transport. Therefore, the central government would promote investments in public transport as well as measures that make its use more attractive than in the past. Towards this end, the Central government would encourage all State capitals as well as other cities with a population of more than one million to start planning for high capacity public transport systems. In doing so, they should look at various proven technologies around the world, including the use of available waterways, They should adopt a technology that would best suit the city requirements in the next 30 years. Comprehensive city wide plans should be drawn up comprising trunk and feeder corridors as well as good integration with personal modes, suburban traffic, etc. High cost trunk route systems should, through appropriate hub-spoke arrangements be integrated with feeder systems that enable higher ridership on such trunk systems. Offer 50% of the cost of project development whenever such projects are sought to be taken up through public-private partnerships, so that a sound basis for attracting private partners can be established. The remaining cost of such project development would have to come from the city development authority/State government and a project developer. 16. So far, fares for public transport have been set on the premise that this mode of travel is used by the poor, who have no other means of meeting their travel needs. As such, fares have been kept low as a measure of social equity. This has resulted in most public transport systems being unable to recover their operating costs. It has, in fact, encouraged poorly operated systems that have been financially sustainable only through serious compromises on the quality of the service they render. In the present day context, however, public transport serves another social purpose. It helps reduce congestion and air pollution, if users of personal vehicles can be persuaded to shift to public transport. Their needs are, however, for improved quality and not so much for low fares. It is, therefore, necessary to think of different types of public transport services for different segments of commuters. Those who place a premium on cost are the poorest sections of society and need to be given affordable prices. The cost of providing public transport for them needs to be subsidized by other sections of society. However, there is another segment that values time saved and comfort more than price. This segment is comparatively better off and would shift to public transport if high quality systems are available to them. The cost of providing public transport to them need not be subsidized and can be met from the fare revenues. As such, the Central Government would encourage the provision of different levels of services – a basic service, with subsidized fares and a premium service, which is of high quality but charges higher fares and involves no subsidy. 17. To facilitate this, the Central Government would offer support under the NURM for premium service infrastructure such as improved bus stations and terminals, improved passenger information systems, use of intelligent transport systems for monitoring and control, restructuring of State Transport Corporations, etc. 18. To ensure that the fares charged are fair and reasonable, the Central government would require that a regulatory authority be set up by the State Government to, inter-alia, regulate the prices to be charged by different types of public transport services. 19. There is a wide spectrum of public transport technologies. At one end are high capacity, but high cost, technologies like underground metro systems and at the other are low capacity bus systems running on a shared right of way. Within these extremes are a range of intermediate possibilities, such as buses on dedicated rights of way, elevated sky bus and monorail systems, electric trolley buses, etc. While some of them are most effective over high density trunk corridors others prove useful as feeder systems or sub- systems that serve limited sub- areas within a city. Similarly, there are examples of available waterways being taken advantage of for public transport as also systems like ropeways that suit hilly terrains. While the high capacity rail systems and buses on shared rights of way are the only ones tried out in India, several of the others have proved successful in other parts of the world. Electric trolley buses have been running in San Francisco. New Bus Rapid Transit Systems (BRTS) have become very popular in cities like Bogota (Colombia) and Curritiba (Brazil). 20. Each of these technologies has its unique characteristics and is best suited to a specific situation. Factors such as the urban form, terrain, availability of waterways, level of demand, direction and extent of sprawl, projections for future growth, extent of population density etc. are major determinants of the technology that should be chosen. The table at Attachment – I highlights the advantages and disadvantages of some of the available public transport technologies also indicating the technologies that best suit different local situations. While rail based systems seem to suit dense cities with limited sprawl and only a few spinal corridors, bus systems seem better where urban densities are lower and the city has spread over a large area. Given the wide range of possibilities, it is not possible to prescribe a particular technology in a generic policy and such a choice will have to be made as a part of city specific land use and transport plans. It would also depend on the kind of city that would need to evolve at the particular location. The Central Government would, therefore, encourage all proven technologies and not promote any specific technology. In order to facilitate the proper evaluation of all the available technologies around the world, it would create a knowledge center that would provide the necessary information required for taking the right technological decisions for a specific city. Wherever necessary, support would be provided for techno-economic studies to be conducted by leading global consultants. 21. All cities have corridors that have varying densities of travel and hence need technologies that best match the level of demand on the corridor. This often requires different operators managing such systems. However, a good public transport system is one that is perceived by the user as a single system and allows seamless travel between one made and the other as also between systems managed by different operators. Such seamless interchange is possible if proper inter-change infrastructure is available and users are able to use a single ticket over all such systems. This also requires that a single agency takes responsibility for coordination so that there is a common approach to public transport planning and management. 22. Accordingly, the Central government would expect that investments in public transport systems would also seek to ensure that such systems are well integrated and offer a seamless system to the users. Central government’s financial support would be contingent on appropriate authorities/entities being set up to ensure that a coordinated and integrated public transport system becomes available. Initiatives taken to promote non-motorized transport and improve safe access to public transport. Willingness to introduce premium public transport systems that are priced high but offer better quality with a view to limit the subsidy requirements in normal services. 24. The basic principle in financing such public transport systems would be that the government should provide the infrastructure but the users (direct and indirect beneficiaries within the city) must pay for the operating costs and the rolling stock. 25. The Central government’s capital support would take the form of equity participation or one time viability gap funding and would be subject to a ceiling of 20% of the capital cost of the project. Preference will be given to those who are able to demonstrate additional resources for the project through dedicated taxes and innovative financing methods. 26. Para transit is normally expected to fulfill a need that neither public transport or personal vehicles are able to fulfill. They normally cater to a category of occasional trips such as trips to airports or rail stations with excessive baggage, or emergency trips that have to be undertaken immediately and it is not possible to wait for public transport. Para transit would not normally be used for regular commute trips to work or school. However, when the quality of public transport deteriorates, para-transit tends to substitute for public transport. Unfortunately, this has started happening in many Indian cities. As such, this policy would seek to restore para-transit to its normal role by persuading the improvement of public transport. 27. With increasing urban sprawl and rising income levels, non-motorized transport has lost its earlier importance. Statistics show that the share of bicycle trips out of the total trips in Delhi has declined from 17% in 1981 to 7% in 1994. The longer trip lengths have made cycling more difficult. Further, non-motorized modes are also exposed to greater risk of accidents as they share a common right of way with motorized vehicles. However, non-motorized modes are environmentally friendly and have to be given their due share in the transport system of a city. The problems being faced by them would have to be mitigated. 28. First of all, the safety concerns of cyclists and pedestrians have to be addressed by encouraging the construction of segregated rights of way for bicycles and pedestrians. Apart from improving safety, the segregation of vehicles moving at different speeds would help improve traffic flow, increase the average speed of traffic and reduce emissions resulting from sub-optimal speeds. Such segregated paths would be useful not only along arterials, to enable full trips using NMT but also as a means of improving access to major public transport stations. Such access paths, coupled with safe bicycle parking places, would contribute towards increasing the use of public transport. Creative facilities like shade giving landscaping, provision of drinking water and resting stations along bicycle corridors would also be encouraged as they can mitigate, to a large extent, adverse weather conditions. The use of the central verge along many roads, along with innovatively designed road crossings, seems to offer promise for being developed as cycle tracks. 29. It has been the experience that many such cycle tracks and pedestrian paths do not get used as initially envisaged. However, a view has been that this is because these facilities are designed badly and without fully recognizing the limitations and problems faced by cyclists or pedestrians. It would, therefore, be essential that such facilities be constructed after an open debate on the designs with experts and the community that is expected to use them. It is expected that such public appraisal would lead to designs that enable greater use by the potential beneficiaries. Encroachment of footpaths too affects pedestrian safety adversely and requires strict enforcement coupled with public participation. Pedestrian safety is also adversely affected by the lack of safe crossing facilities at busy intersections of even high traffic corridors. 31. The Central government would support the construction of safe pedestrian crossings at busy intersections and high traffic corridors. 32. 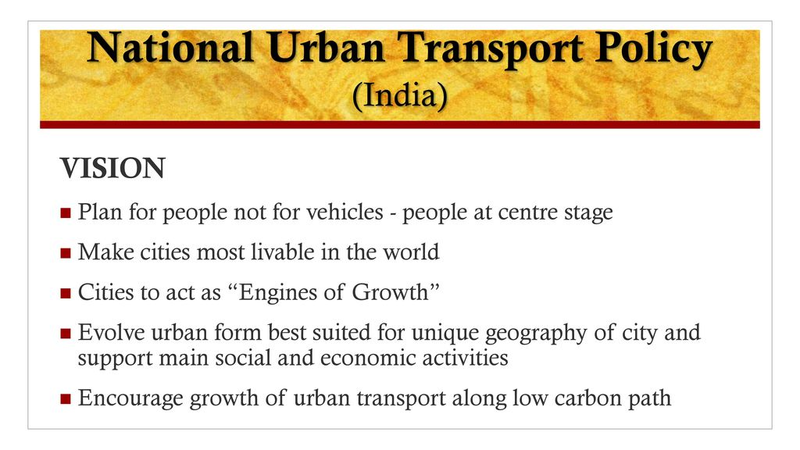 The Central Government would support formulation and implementation of specific “Area Plans” in congested urban areas that propose appropriate mix of various modes of transport including exclusive zones for non-motorized transit. 33. The Central Government would also take up pilot projects, in a sample set of cities, to demonstrate the improvements that are possible through the enhanced used of cycling, for possible replication in other cities. 34. Land is valuable in all urban areas. Parking places occupy large portions of such land. This fact should be recognized in determining the principles for allocation of parking space. 35. Levy of a high parking fee, that truly represents the value of the land occupied, should be used as a means to make the use of public transport more attractive. Preference in the allocation of parking space for public transport vehicles and non-motorized modes as well as easier access of work places to and from such spaces would go a long way in encouraging the use of sustainable transport systems. Park and ride facilities for bicycle users, with convenient inter-change, would be another useful measure. Simultaneously, a graded scale of parking fee, that recovers the economic cost of the land used in such parking, should be adopted. The objective would be to persuade people to use public transport to reach city centers. State governments would be required to amend building bye laws in all million plus cities so that adequate parking space is available for all residents / users of such buildings. To enable this, FAR norms would be made more liberal. Multi-level parking complexes should be made a mandatory requirement in city centers that have several high rise commercial complexes. Such complexes could even be constructed underground, including below areas declared as green belts in the master plan. Such complexes could come up through public-private partnerships in order to limit the impact on the public budget. All such parking complexes would be encouraged to go in for electronic metering so that is there is better realization of parking fees to make the investments viable and also a better recovery of the cost of using valuable urban space in the parking of personal motor vehicles. In residential areas too, appropriate changes in bye-laws would be considered to free the public carriage way from parked vehicles that impede the smooth flow of traffic. Proposals for parking complexes would also be given priority under the National Urban Renewal Mission. Provisions would also be made in the appropriate legislation to prevent the use of the right of way on road systems for parking purposes. 36. As economic activities in cities expand and city population grows, a substantial amount of freight traffic would be generated. The timely and smooth movement of such freight is crucial to the well being of the people and the viability of the economic activities they undertake. However, with limited capacity of the transport system, it is essential that freight traffic and passenger traffic are so staggered as to make optimum use of the transport infrastructure. It is a time honored and tested practice to use off-peak passenger travel times to move freight. Many cities have earmarked late night hours for the movement of freight and restricted the entry of heavy vehicles into cities during day time. Further, several cities have by-passes that enable through traffic to go around the city and not add to city traffic. These practices are sound and would be encouraged in all cities. For this purpose, cities would be encouraged to build by-passes, through innovative and viable public – private partnerships. Similarly, facilities for the parking of freight vehicles outside city limits, such as truck terminals, would also be encouraged through public-private partnerships. Proposals for such facilities would be considered under the National Urban Renewal Mission. 37. The current structure of governance for the transport sector is not equipped to deal with the problems of urban transport. These structures were put in place well before the problems of urban transport began to surface in India and hence do not provide for the right co-ordination mechanisms to deal with urban transport. The Central Government will, therefore, recommend the setting up of Unified Metropolitan Transport Authorities (UMTA’s) in all million plus cities, to facilitate more co-ordinated planning and implementation of urban transport programs and projects and an integrated management of urban transport systems. Such Metropolitan Transport Authorities would need statutory backing in order to be meaningful. 38. The Central Government would also encourage the setting up of professional bodies that have the capacity to make scientific assessment of the demand on various routes and contract services that can be properly monitored. Towards this end, it would encourage the setting up of umbrella bodies that regulate the overall performance of the public transport system and ensure that the city has a comprehensive public transport system. Such bodies would, inter-alia, design networks and routes, assess demand, contract services, monitor performance, manage common facilities like bus stations and terminals, etc. They would have representation from all the major operators and stakeholders. 39. Model legislation would be drafted for cities to consider and adopt, with such modifications as may be required to suit city specific requirements. 40. The responsibility for the planning and implementation of urban transport systems rests with the State governments and the municipal bodies. 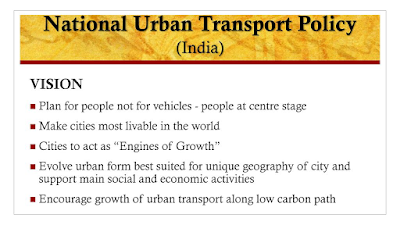 However, since the problems associated with urban transport are of relatively recent origin in India, having surfaced only from the early 1990s, the ability to fully understand and deal with these problems is yet to fully mature. This calls for concerted efforts at strengthening capabilities at the State and city level to address these issues and undertake the task of developing sustainable urban transport systems. 41. Capacity building will have to be addressed at two levels – institutional and individual. Institutional capacity would primarily involve creating a pool of knowledge and a knowledge management center that would sustain and enhance expertise as well as facilitate more informed planning. It would also sponsor regular research to help formulate the right mitigation strategies, without merely adopting what other countries have tried. The Institute of Urban Transport (India), an existing institute under the purview of the Ministry of Urban Development would be suitably strengthened to discharge this responsibility. It would be built up to serve as a national level facility to provide continuous advice and guidance on the principles of good urban transport planning as emerges from its research. Advice on new technologies would also be regularly available to implementing agencies from this institute. For this purpose, the institute would become a store house of information on the various public transport technologies being used in different parts of the world and would maintain the latest information and literature on the experience with such technologies. It would, in fact be a comprehensive repository of the best practices in the field. 42. The virtual lack of a database on urban transport statistics has severely constrained the ability to formulate sound urban transport plans and reliably assess the impact of the different initiatives that have been taken. The national level institute would build up a database for use in planning, research, training, etc in the field of urban transport. 43. The Central Government would also encourage the development of such institutional capacity at the State level through the platform of the National Urban Renewal Mission. A specific scheme would need to be formulated for this purpose. 44. At the individual level, a major exercise of training and skill development of the public officials and other public functionaries would be taken up to make such officials aware of the nuances of urban transport planning and the specific issues involved in managing city transport. This would be targeted at personnel belonging to the State transport departments, municipal corporations, metropolitan development authorities, traffic police, environmental authorities, State Transport Corporations, Public Works Departments, etc. 45. It is recognized that there are several proven technologies for public transport around the world that have yet to be adopted in India. In order to build up the necessary capacity to adopt such technologies within the country, the Central Government would facilitate joint ventures and collaboration agreements between such technology providers and suitable Indian companies. Necessary incentives would be provided to enable such technologies to get commercialized in India. This could be by way of financing customized prototypes, development of designs to suit Indian conditions, trial operations, training of the technical personnel, etc. The objective would be to ultimately build a level playing field for all proven technologies. 46. As part of the exercise of skill development, academic programs in urban transport, especially at the post-graduate level, would be strengthened so that a nucleus of qualified urban transport professionals becomes available in the country. Suitable collaborations, with leading institutes abroad, would be established to offer expertise to such programs in the initial years. An annual urban transport conference would also be institutionalized, to bring together the urban transport professionals in the country to share their experiences. International experts would be invited to such a conference so that Indian professionals are able to exchange information and learn from developments and experiences abroad. A well rated urban transport journal would also be started. 47. While petroleum based fuels are by far the most commonly used today, other alternatives have been emerging, though slowly. CNG has been adopted in a big way for bus transport in Delhi. Electric trolley buses are also being proposed in the city. Electric vehicles have already entered the market for cars and auto rickshaws. Electric two wheelers are also under development. Such cleaner technologies need to be encouraged so that the problem of vehicular pollution can be more effectively dealt with. Besides, renewable sources need to be tapped as a measure of sustainable development and in recognition of India’s energy security concerns. The Central Government would, therefore, encourage the research, development and commercialization of cleaner technologies. 48. New technologies always find it difficult to enter an established market and new auto fuel technologies would also face this problem. However, in view of their many advantages, they would be offered suitable concessions and benefits that would enable them to make an entry and compete with established technologies on more equitable terms. It is expected that such competition will also encourage established technologies to improve their performance characteristics and compete with the emerging choices. 49. Several vehicles on our roads tend to be poorly maintained and are overly polluting. This is partly because the requirements of proper maintenance are not stringent and are largely driven only by the owner’s motivation to save on fuel cost. Even where such motivation exists, the lack of a widespread network of good quality repair facilities discourages them for the exertion of having their vehicles periodically tested. 50. In order to overcome these problems, the Central Government would, lay down a clear and time bound schedule of progressively tighter emission norms, with adequate lead-time, to allow the auto and oil industry to make the required investments. Measures would also be introduced to incentivize the use of fuel efficient (zero pollution) and small sized vehicles that use up little road space and also cause low pollution. Statutory provisions would also be introduced requiring all in-use vehicles in a city, including personal motor vehicles, to undergo a periodic check up and obtain a specified certification. States would be encouraged to set up such certification facilities, in partnership with the private sector. The Central Government would also support the establishment of training centers for the staff of such certification establishments so that there are adequate skilled personnel, both for certification and for undertaking the required repairs. All of these would require that an effective regulatory body be set up to prescribe, monitor and enforce the adherence of emission and safety standards. 51. It is evident that huge capital investments will be required in dealing with the urban transport problems. Whether they are for constructing capital intensive mass transit systems or segregated rights-of-way for cycles and pedestrians, a substantial financial burden would devolve on the government. Most State governments and local bodies do not have the required resources and, therefore, alternative methods of financing would have to be explored. 52. The Central Government would encourage the levy of dedicated taxes to be credited to an urban transport fund and used exclusively to meet urban transport needs within the State. Such dedicated taxes could be in the form of a supplement to the petrol and diesel taxes, betterment levy on land owners or even an employment tax on employers. In fact, revenues from a betterment levy along new high capacity public transport corridors would be included as a component of the financing plan for such new public transport systems. 53. The Central Government would also encourage partnerships and greater use of private capital in areas where the private sector can competitively deliver urban transport services. More specifically, the greater use of private buses in city areas would be encouraged to reduce the dependence on public budgets. The commercial utilization of land resources, available with public transport service providers, is also recommended to raise additional resources. 54. There are several activities in which the private sector can be beneficially engaged, thereby saving financial resources for activities that only public agencies can best perform. However, these have to be done under conditions that strike a fair balance between the universal obligations of the government and the profit motive of the private operator. Accordingly, the Central Government would encourage a more liberal use of the private sector, especially in activities like the operation and maintenance of parking facilities, certification facilities, repair facilities, construction and management of terminal facilities, etc. Till the mid 1980s most public transport services were largely provided by publicly owned State Transport Corporations. Since then, however, some States have permitted privately run services. While public operations have tended to be high cost and most State Transport Corporations have run up heavy losses, the reliability and safety record of inadequately regulated private operators has been poor. On balance, the Central Government would encourage the State Governments to involve the private sector in providing public transport services, but under well structured procurement contracts. 55. Urban transport policies can not succeed without the fullest co-operation of all the city residents. Such cooperation can be best secured if the objective of any initiative is made clearly known to them. It is, therefore, necessary to launch intensive awareness campaigns that educate people on the ill effects of the growing transport problems in urban areas - especially on their health and well being. The campaigns would seek their support for initiatives like greater use of public transport and non-motorized vehicles, the proper maintenance of their vehicles, safer driving practices, etc. Such campaigns would also encourage individuals, families and communities to adopt “Green Travel Habits” that would make travel less polluting and damaging. The Central Government would take up a major awareness campaign in this regard and seek the support of the State Government in its implementation. Particular emphasis would be laid on bringing about such awareness amongst children through inputs in their school curricula. 56. In order to demonstrate the potential benefits from the policy measures suggested herein, the Central Government would take up pilot projects in a sample set of cities drawn from different regions and different city types so that tested models of best practices can be established for replication in other cities. North America Very high density corridors, where road space is very limited.